This just in: Bad reviews didn’t stop a bunch of people from paying to see the world’s most famous superheroes slug it out on the big screen. In other breaking news, the sun came up this morning. Also, gravity is still a thing. While Variety bloviated about critics not mattering anymore, pitting the low Tomatometer score of Batman V Superman against the fortune it earned this weekend at the box office, the world kept turning—and not backwards—for anyone fully prepared for these results. A critic’s job is not to stop a preordained blockbuster in its tracks, even if that were possible. A critic’s job is to grapple with the artistry and value of all cinema, high and low, and to give readers some idea of what to expect from the films coming to a theater near them. To attribute the success of this latest superhero bonanza to some sort of populist backlash against criticism is to manufacture a convoluted explanation for something very simple. People like superhero movies in general. People like Superman and Batman in particular. Bad reviews were never going to stop people from seeing this thing for themselves. Nor should they, necessarily. So just how big of a hit is Batman V Superman? Think Wayne Industries numbers. Think Lexcorp profits. The Zack Snyder tentpole has raked in about $170 million domestically since Thursday night, securing it the sixth best opening weekend of all time behind some crosstown rivals, some rampaging dinosaurs, and those lovable new Jedi. BvS also did stiff business worldwide, pulling in $424 million from about a dozen different international markets. 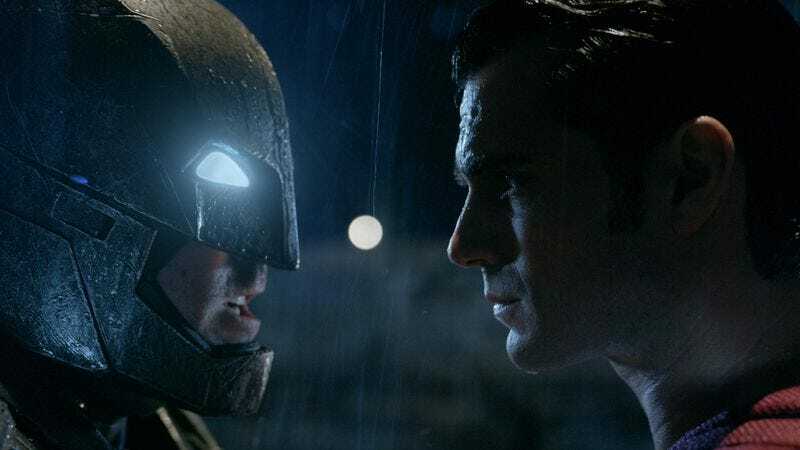 Analysts are now wondering what to expect from the film’s encore weekend; Man Of Steel fell 64.6 percent in its second weekend—and that film scored an A- CinemaScore, not the B Batman V Superman has managed. Will word of mouth do the damage reviews didn’t? This weekend, another widely panned sequel dared to open against “the greatest gladiator match the world has ever seen”—and it did fine, relatively speaking. My Big Fat Greek Wedding 2 picked up $18.1 million in counter-programmed ticket sales, which is pretty good for a belated follow-up to a surprise hit—though it probably won’t come within Windexing distance of its predecessor, still the highest-grossing romantic comedy of all time. Business was very quiet for the limited release offerings, with the biopics of Hank Williams and Chet Baker scoring around $50K each on five and three screens, respectively. Next weekend, a Miles Davis movie will attempt to shake more from its target audience. Meanwhile, only one wide release this coming weekend dares take on the red and black capes: God’s Not Dead 2, another film about an almighty power going toe-to-toe with self-righteous skeptics. Presumably, there will be less punching.